This is quite possibly the most delicious store-bought lemonade I’ve ever had. Trader Joe’s has thrown down a gauntlet for all lo-cal beverage manufacturers in creating a drink with only 40 calories per 8-ounce serving. And the secret to their success? STEVIA. Stevia is, admittedly, a bit of a shock to the system when it’s the only sweetener in the cup; but TJ’s has softened it with the addition of a small amount of organic cane sugar. The result is a guiltless guzzle of epic proportions. For you organi-philes, this will be an especially refreshing drink. The front label proudly states that the lemonade is made with organic lemon juice, but it also includes other organic ingredients: cane sugar, lemon extract, lemon juice concentrate, and flavor (all certified by QAI). 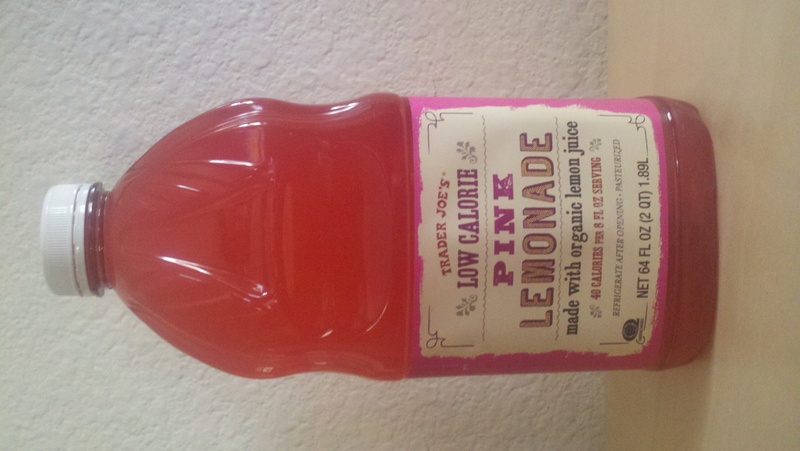 .Now, if you go searching for this gem in your local TJ’s, you will see that there are actually TWO lo-cal lemonade options: yellow and pink. There are people who insist that you cannot tell the difference, but our family has tried them both and swears that you can. DH, DS, and I prefer the pink version; my parents prefer the yellow. The only discernible difference on the label is the addition of black carrot extract (for color) to the pink version. Both versions contain “organic flavor” and “natural flavor”, so the secret may lie therein. I’d like to believe that, somewhere in the pink’s natural and organic flavor formulary, there is just a tiny extra bit of sunshine and happiness that seems lacking in the yellow. Or maybe I just like the color better. Either way, it rocks my tastebuds. Incidentally, in our house the half-gallon container is a one-day supply. It’s a safer beverage alternative for the DH, since it’s reduced-sugar and low in phosphorus (two considerations for Type-1 diabetics everywhere). So on my once-weekly trip to TJ’s, I generally purchase 7-10 1/2-gallon bottles. The one time our local store was out (since the warehouse was out also), DH had to go without for almost two weeks. One the outside he was calm, but I know on the inside he was practically rabid over the loss.